Therapy Chicago: Should I Leave My Job? Workplace stress is one of the most common reasons that lead people to seek therapy. As much as we may want to separate our work and our personal lives, it is difficult to avoid the stress of the former bleeding into the latter. 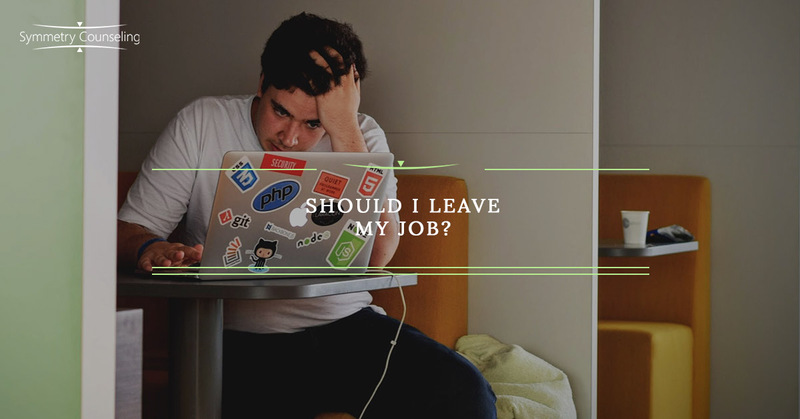 An important conversation that often emerges is an evaluation of when, if at all, it is right to leave an employer. The most common grievances revolve around feeling underappreciated or undervalued. Often individuals feel overworked, underpaid, highly stressed, and subject to the mood swings of others. Yet we often waver for weeks, months, or sometimes even years regarding the validity of our complaints. While there is no one way to make this decision, there are elements that can help the process along. Is there anything I can do to improve this situation? Many of us struggle with communicating our needs. Even in work, all difficult conversations are ultimately based in emotion. If your concerns are about hours, distribution of duties or pay, then it may be worthwhile to consider a conversation with a supervisor. Therapy can be crucial at this stage to help address self-esteem, assertiveness, and communication. Start by making a list of the logistical issues and brainstorm possible realistic solutions. Even if they are not received with open arms, you will know that you have taken the time to try and make the workplace better. If your concerns are more related to workplace culture or morale, still reflect on possible improvement strategies and address them at a staff meeting if appropriate. However, in this case, you may need to rely more heavily on leading by example. If gossiping is rampant in the office, make it a priority to avoid this behavior although be cognizant of not criticizing others outright. What are my professional values? Many conflicts ultimately condense to an issue of values. In the case of work, a common issue is an employee feeling as though their values are in conflict with those of their organization. Despite what we may have been promised by social movements, the media, and highly supportive parents, we may not actually be able to “have it all.” It is impossible to have a job that meets all our criteria of perfection: commute, duties, pay, benefits, culture, management style, scheduling, and other industry-specific factors. Make a list of these components and rank them in order of importance by asking yourself “what do I value most?” If you are struggling, start asking comparative questions such as “would I be willing to accept lower pay for more flexibility in scheduling?” Afterwards, write out your various concerns or grievances with your current workplace. Compare the two lists and note if the values that you ranked as most important are the ones affected. How do I know if this is the right decision? While we often utilize the mind to make big decisions, this is also the time to incorporate the wisdom of the body. For those in tune with their own intuition, the answer may come as a “gut feeling.” For those who struggle with understanding and trusting emotions, the process may be hazier. Explore job postings and notice whether you are filled with excitement, dread, or something else. Therapy may be useful at this stage to learn how to read and trust the messages your body may be giving. Even if you stay with an employer, you are making a decision to stay. Making decisions gives us a sense of autonomy and control in our lives. It also may be worthwhile to give yourself a date in the future to re-evaluate. If you are struggling with workplace stress or big decisions, let us know how we can help! We’re here for you and your well-being. Contact us at Symmetry Counseling (312)-578-9990.